From my desk in a muggy office I anxiously check the BBC weather website to see if my seaside garden is experiencing the same sleety conditions. At 3°C the night temperature teeters on the right side of danger, but it’s close. I dwell on how cruel it would be to lose treasured plants during winter’s last gasp. As I leave the building a blast of chill air hits my face and makes me flinch. I can’t recall a frostier finale to April. Watching the garden move towards spring has been like watching a film in slow motion, or recounting one of those bad dreams where one never quite reaches one’s destination. It has been dawdling and drawn-out, although not painful, yet. Cold is a powerful preservative and anaesthetic, putting a break on plants’ development, delaying flowering and keeping blooms fresh for longer. Never has our magnolia, our sophora or our Kerria japonica bloomed continually for four months uninterrupted. Nor have I enjoyed such a long season among the daffodils. Spring has been like a cruise on the Rhine; long, languid and leisurely, with time to look back and admire sights that might have passed in a blur any other time. And so, via an appropriately ponderous route, I arrive at today’s subjects, the flower buds of Tulipa “Rococo”. I know by reputation that the frilly flowers will ultimately be decadent velvety-red, feathered with scarlet, plum and Chartreuse. From their first emergence through a cover of coarse grit, the buds have been fascinating to observe as they begin to pull away from the cool green leaves, showing flashes of kaleidoscopic colour at their fringes. 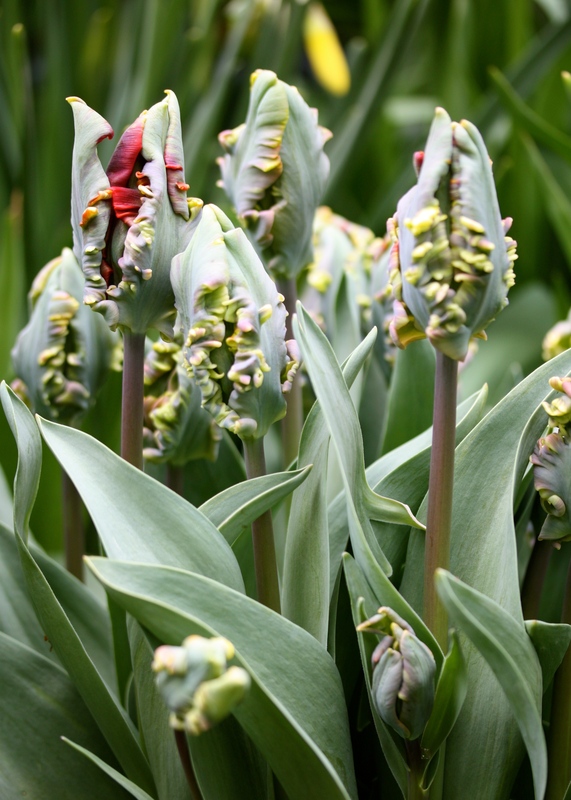 As parrot tulips go, Tulipa “Rococo” is earlier and shorter than most, making it an ideal candidate for a pot. If that were not recommendation enough, the flowers are also scented. This being my first time I have planted the bulbs in small, tall Long-Toms so that I can move them about to find good colour companions later. It snowed today in Central London, but in my garden it was totally tropical. Do check back on this post to see what happens when the buds eventually unfurl. Got to have some of those next year Dan, those buds look almost prehistoric. Look forward to seeing the buds unfurled. They are most unusual aren’t they? I thought a little conch-like too? I imagine you will be ‘over’ tulips by the time you return from Keukenhof and ready for a taste of summer? Have a splendid time. Yes, I also cannot wait to see them fully open. In bud they look, hm… not very healthy, like warts growing on smooth skin… sorry Dan but this was the first impression I got of them. Sorry for your cold weather. 45 years of Tulip love . . . .your spring flowers must be a joy to see and also to anticipate through the winter, like the pending arrival of old friends. Yes Jan, it’s very much like that. Absence through the rest of the year makes my heart grow fonder. I too thought there was something wrong when I first looked. Of course, on closer inspection, they are simply amazing and thanks for sharing Dan. As to weather, we’re still in shorts and t shirts with very little rain to be had. Last decent fall was in January which is nothing unusual given our location but still desperate for some. Thankfully I don’t rely on the weather for an income any more. Back to tulips, the local generic nursery are selling them, and hyacinths, but I just can’t bring myself to buy any. Wrong plant, wrong place, wrong time. Looking forward to your next photos. The idea of wearing shorts and t shirt is pretty attractive to me right now. I am still in winter coat, long socks and boots. However I don’t envy your lack of rain. Lovely tulip buds Dan! A friend of mine photographed ‘Rococo’ petals individually after they had dropped onto a piece of coloured card and used it as a greetings card to send me. It is still in the living room 2 years later! I must try planting it here (I’ve always thought we were not flashy enough for it!) I’ve been enjoying the slow spring so much – usually ours flashes past in a blast of heat around this time. But I have a young magnolia that is mysteriously dying back in all the rain. I am sorry to hear about your magnolia Cathy. There are so many tree diseases that are spreading about at the moment I can’t imagine what it might be. Perhaps just waterlogging? Sad nonetheless. What a great idea for a card though. You have set me a challenge now! I will let you know in due course if it’s worth trying. I am sure ‘Rococo’ would look wonderful in your garden. I am not sure about this tulip, I am repulsed and attracted at the same time. Is that the point, perhaps? Wow! They look fascinating! And you mentioned the “scent ” word! So? On my list! Thank you! That’s another one to look out for. Don’t intend, though, to find out what parrots smell of! Sounds like a dangerous pursuit, best left to Bear Grylls! Crazy weather! And those are some wild, prehistoric looking buds. The consensus does seem to be that they are somewhere between prehistoric and grotesque! I rather like them though. Him Indoors asked me at the weekend why they had “gone wrong”. ‘There once was an ugly duckling’ comes to mind………………. 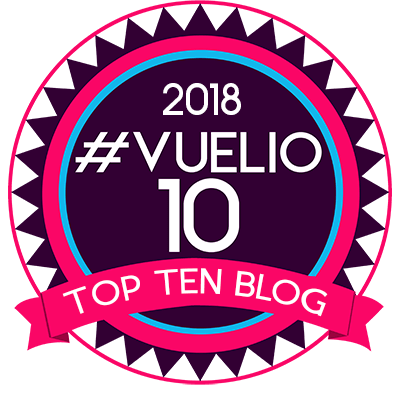 Watching this site with more than my usual interest – I’m intrigued to say the least!! Thanks Sally. The buds are looking more and more exciting as they begin to open. 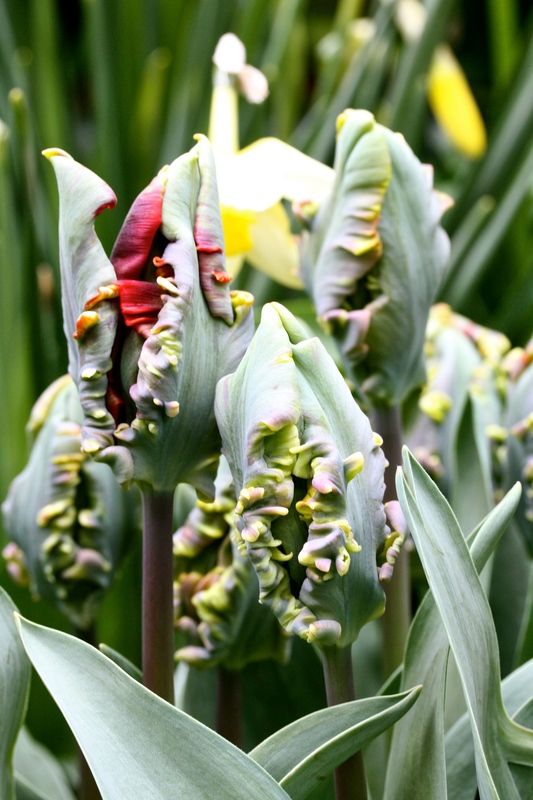 If I were to name this tulip now I’d call it “Red Dragon” as the flowers are blood red, cool green and scaly-looking!